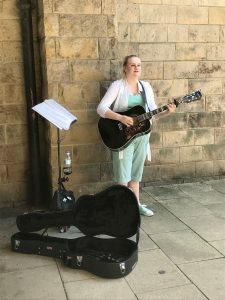 Bishop Auckland Town Team are pleased to announce that Ami Leigh Boorman, one of our regular Buskers, Full Moon Street Food Market and ‘Bishop Celebrating Together’ performers has just released her first ever single! This is extra special because Ami Leigh is on the autistic spectrum and not only performs by herself, is also part of a touring performing band called Aukestra, where some members are Autistic and some not. Ami Leigh is also a volunteer presenter on Bishop FM and really loves to give back to our community. Ami Leigh Music can be found on Facebook, Twitter, YouTube and Instagram.